Whether it be a wobbly bracket or door hinge that keeps working its way loose, it’s quite a common problem found in many homes, especially when the original holes were drilled slightly too big for the screws to be used. After a little time looking into why the wobble is occurring you’re almost sure to discover that the issue is due to the screw hole wearing and the screw thread no longer gripping or tightening within the hole. 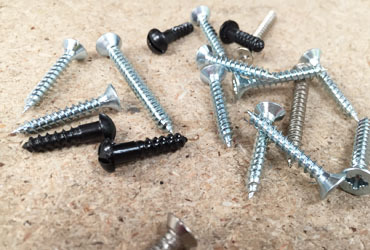 Of course ideally you’d be able to replace the wood and drill new holes for the screws however in practice this isn’t always possible, this post details 8 tried and tested ways to repair a loose wood screw hole. 1) One of the best and strongest solutions yet quite a job for novices is to drill out the stripped screw holes and glue in wooden dowels with the exact same diameter as the drill bit used. After you have tapped the dowels into the holes and once the glue has set cut the dowel off so that is flush with the edge of the wood and drill a pilot hole before screwing into it. This method provides a strong fixing point that is almost as if you were screwing into new wood. 2) Not to be used on screw holes that hold any great weight, but a quick and simple fix for smaller screw holes is wedging a shim mixed with wood glue into the hole. For the shim you can use toothpicks or matchsticks. Once the glue has set simply cut off the shim so that is flush with the edge of the wood. 3) Using over-sized screws is an option, longer or thicker gauge screws. Before using the oversized screws check they aren’t too long for the wood as the last thing you won’t is them popping out the other side. Also make sure the screw heads aren’t too big for any existing countersink holes. 4) Coat a rawl plug with wood glue and tap it into the screw hole. Once the glue has dried, drill a small pilot hole into the rawl plug before re-screwing into the wedge. 5) Using a small piece of pine and a sharp knife you can create a pointed shim to fill the oversized screw hole. Sharpen the pine wood into a pointed splint and tap into the hole. For a stronger hold coat the pine splint with wood glue before tapping into the hole. Once the glue has dried, use a chisel or sharp knife to cut off any overhanging pine flush with the edge of the wood before drilling a small pilot hole ready to screw into. 6) For screws supporting light loads only, you can compact steel wool and stuff it into the hole using a narrow screwdriver or similar tool. Ensure that the hole is stuffed as tightly as possible before screwing back into it. 7) Another method of filling oversized screw holes is by using golf tees. Tap the tee into the hole and mark where it needs to be cut to become flush with the edge of the surface. Remove the tee and cut slightly below the mark so that it will be flush or even slightly sunken. Cover the golf tee with wood glue and tap it back into hole. Allow for the glue to dry and return your fixing screws. 8) Mixing up toilet tissue and white multi-purpose glue will achieve a strong and lasting filler. Take two or three sheets of toilet tissue and mix with 20ml (approximately a tablespoon) of multi-purpose glue, the tissue will disintegrate within no time at all and easily mix together with the glue creating a white clay like filler. Push the filler into the screw hole and take a small nail or wood pin to make a pilot hole. After 30 minutes or so once semi-hardened screw the wood screw into the filler and then take it out. Allow for the filler to completely dry and return the screw. This method is also good for filling holes plaster boards. Now you know how to fill loose wood screw holes, you may also like to read how to choose woodscrews.